It’s May 2017, and Laura and I are finally on our way to Ireland for a combination business and pleasure trip. We’ll check off some of the sites we have yet to see, such as the Rock of Cashel and the Cliffs of Moher, as well as visit the studios and manufacturing facilities of several of our suppliers. After a number of delays both in Cleveland and Newark, we finally arrive late morning in Dublin. That first day in Ireland is always tricky. You arrive in the morning after having flown all night, with very little to no sleep. Your first instinct is to get to your hotel and settle right into bed. But no way are we going to waste one of our few precious days on the Emerald Isle. 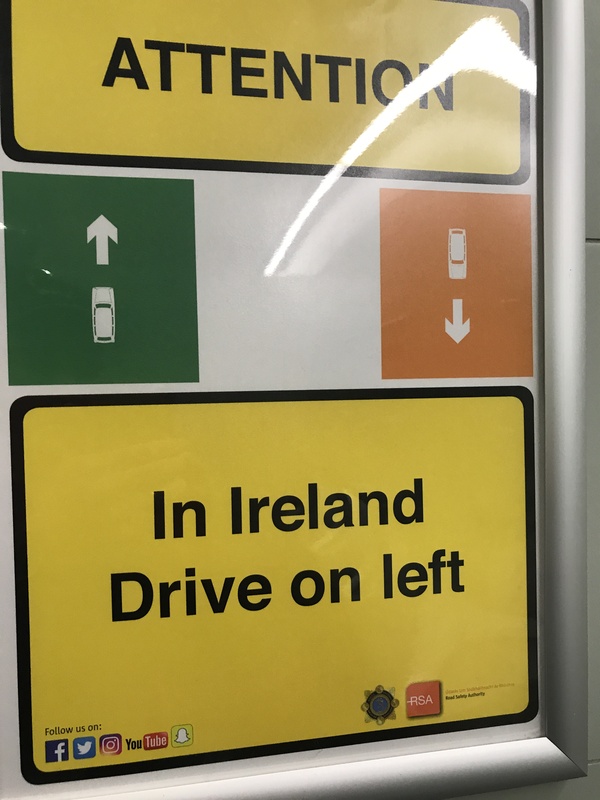 After passing our first sign at the airport reminding us that we will now have to drive on the left, we make our way to our hotel, park our bags in the office (our room is not yet ready), and head out to explore Dublin City. We are famished but not sure what meal to get, since we have missed many by crossing so many time zones. So like good tourists, we head straight to the legendary Leo Burdock’s, Dublin’s oldest chipper, for some traditional fish and chips. Leo Burdock’s fish and chips — the breakfast (lunch?) of champions. The long list of celebrities who grace their Hall of Fame wall include U2, Bruce Springsteen, and Mick Jagger. 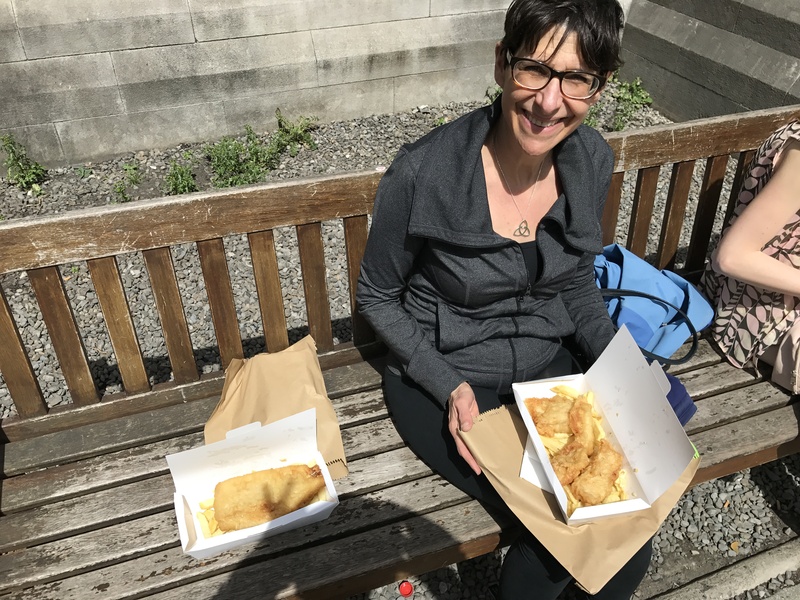 Standing in line with many other tourists for that quintessentially Irish tradition (which sadly is no longer wrapped in newspaper for health reason), we take away our heaping portions and devour them on a bench in front of Christ Church Cathedral. Luckily for us, the sun is shining and it’s a beautiful day. Laura, Tracy, and Doug at the gorgeous Bank on College Green. It is great to see Tracy again and to enjoy a Guinness and Smithwicks with her. Tracy masterfully crafts some amazing jewelry that we carry on our website, capturing the spirit and essence of Ireland’s Celtic past. 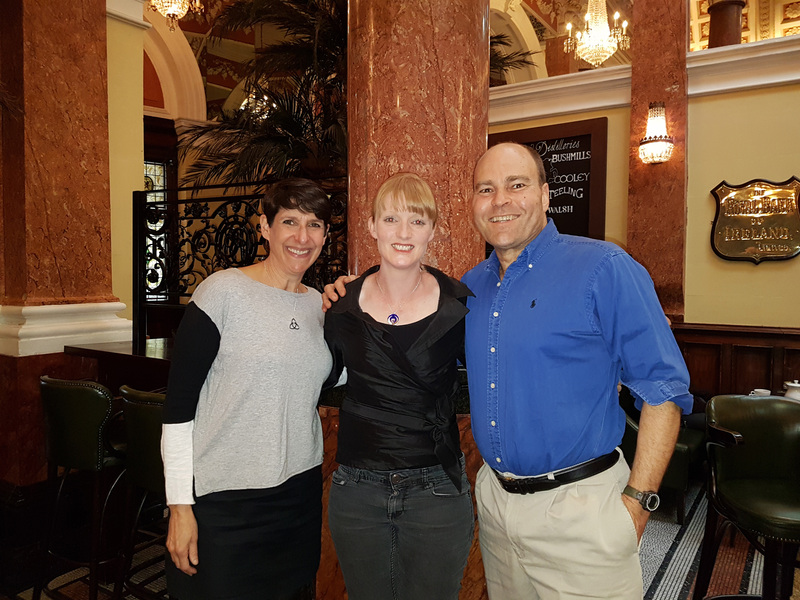 We knew she was an awesome craftsperson, but we also find out that like us, she is a long-distance runner who successfully completed her first marathon, in Dublin, in October 2016. We certainly have a lot to talk about! Several hours later, we say our goodbyes as she has to catch the train to her home and family. Laura and I grab a quick dinner, walk back to our hotel, and check in. 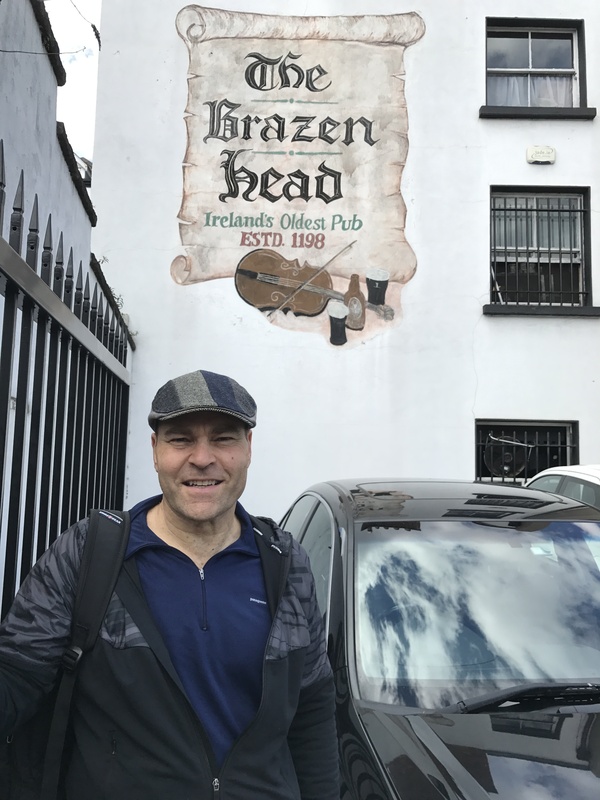 What a terrific first day in Ireland. Jet lag? What jet lag? But now it’s time to rest up for another great day. Want to learn more about Tracy Gilbert’s stunning Celtic-inspired sterling silver jewelry? You can view the Tracy Gilbert Designs Collection here. Trinity Heart pendant with birthstone, handcrafted by Tracy Gilbert.